BOURDON DE DOMBOURG, JEAN-FRANÇOIS, officer in the colonial regular troops; b. 29 Dec. 1720 in the parish of Saint-Barthélemy, La Rochelle, France, son of Jean-François Bourdon de Dombourg et de La Pinaudière and Madeleine Poirel; m. 6 July 1752 at Port-La-Joie (Fort Amherst, P.E.I.) to Marguerite, daughter of the Acadian merchant Joseph-Nicolas Gautier*, dit Bellair, and they had eight children; d. in or after 1789, probably at La Rochelle. 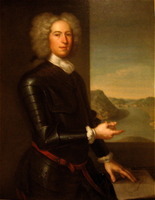 Jean-François Bourdon de Dombourg was brought to Île Royale (Cape Breton Island) in 1733 by his uncle Claude-Élisabeth Denys* de Bonnaventure. He probably began his military career immediately, but he was made a gentleman cadet only in 1736. Evidently he had some skill with languages: by 1739 he was acting as an “interpreter for the Micmac Indians” and in 1741 he was formally posted to Abbé Pierre Maillard*’s mission on Île Royale in order to extend his knowledge of Indian tongues. The same year he blew off his left hand when proofing some guns which were to be given to the Indians as gifts from the king. This loss did not apparently lessen his fighting ability, however, for in May 1744 he was ordered to assemble the Indians in Acadia to “make war on the English.” With 250 Indians, he participated in at least one unsuccessful attack on Annapolis Royal (N.S.) that summer [see Paul Mascarene*]. Returning to Louisbourg in November, he was taken prisoner at the siege the following year and sent to France. He served in the unsuccessful expeditions of the Duc d’Anville [La Rochefoucauld*] to Acadia in 1746 and Governor La Jonquière [Taffanel*] to Canada in 1747. When Île Royale and its dependencies were reoccupied by France in 1749 following the treaty of Aix-la-Chapelle, Bourdon was immediately seconded to Île Saint-Jean (Prince Edward Island) as an interpreter. Promoted several times during the 1740s, he was finally made lieutenant in 1750. Like many of his fellow officers, he served at outposts such as Île Saint-Jean and Port-Toulouse (near St Peters, N.S.) 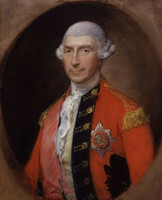 before his final posting to Louisbourg. One week before Louisbourg’s capitulation to Amherst on 27 July 1758, Bourdon was ordered to join Charles Deschamps de Boishébert’s “flying camp” of colonial regulars, Acadian partisans, and Indians. By 1759 he was at Restigouche (Que.) in charge of a handful of troops and more than a thousand Acadian refugees. The winter of 1759–60 was hard: he was reduced to eating “cowhides, beaver skins, and dogs.” Hunger was not his only problem, for the missionaries Maillard, Jean Manach*, and Charles Germain were treating for peace with the British. Although Manach attempted to explain his actions as being in the Acadians’ best interests, Bourdon sent the Acadians at Miramichi (N.B.) a letter appealing to their pride. “Where on earth,” he asked, “is [your] patriotism, [your] devotion to religion. . . .” Manach intercepted the letter, but its contents became generally known and Bourdon succeeded in attracting a group of Acadians to Restigouche. He also prepared a dossier for Governor Vaudreuil [Rigaud] which virtually accused the priests of treason. In late May 1760 Bourdon received unexpected aid. A French convoy destined for Canada had had to take refuge in the Baie des Chaleurs not far from Bourdon’s post. François-Gabriel d’Angeac, captain of the troops aboard the vessels, took command of the post and with François Chenard de La Giraudais, commander of the convoy, improvised defences. On 27 June a British squadron under Captain John Byron began an assault. The French forces held until 8 July, when the frigate Machault and most of the remaining supply ships were fired, and the troops retreated into the woods. Byron returned to Louisbourg and it was not until late October that Major Robert Elliot* arrived to take the surrender of the French forces. By the terms of the capitulation Bourdon was sent to France. 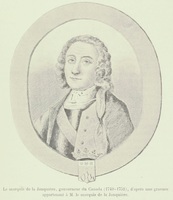 His wife and children were taken to Halifax, Nova Scotia, and did not join Bourdon in La Rochelle until November 1764. The later part of Bourdon’s life is only sketchily known. In May 1764 he was retired from the colonial regulars with a pension of 400 livres. He seems to have been poor, for as late as 1773, when requesting a captain’s commission in a new regiment, he referred to his “poverty-stricken state.” In 1775 he was made a knight of the order of Saint-Louis, an honour that included a pension. Perhaps, however, his poverty was relative to his estate; our last record of him, in 1789, shows him sitting in the nobles’ assembly of the seneschal jurisdiction of La Rochelle. AN, Col., B, 59, f.547; 74, f.554v; 84, p.316; 86, p.312; 91, p.348; 120, f.577v; 181, f.225v; C11A, 105/1, pp.82–162, 179–84; C11B, 22, f.127v; 27, f.283; 28, ff.26, 68; 29, ff.26–28; 31, f.77v; D2C, 4, p.132; 5, f.330; 48; E, 47 (dossier Bourdon de Dombourg); Section Outremer, G1, 411/2; 458, f.20v; 459, f.12v (paginated references are to PAC transcripts). Knox, Hist. journal (Doughty), III, 353–421. Æ. Fauteux, Les chevaliers de Saint-Louis, 203. Archange Godbout, “Familles venues de La Rochelle en Canada,” R.-J. Auger, édit., ANQ Rapport, 1970, 114–367. Régis Roy, “Bourdon de Dombourg,” BRH, XXVIII (1922), 243. Andrew Rodger, “BOURDON DE DOMBOURG, JEAN-FRANÇOIS (b. 1720, d. in or after 1798),” in Dictionary of Canadian Biography, vol. 4, University of Toronto/Université Laval, 2003–, accessed April 20, 2019, http://www.biographi.ca/en/bio/bourdon_de_dombourg_jean_francois_1720_1798_4E.html.